When you're just getting into triathlons, you may not want to make a huge investment into something like a wetsuit. That's what makes the Zoot Z Force 1. 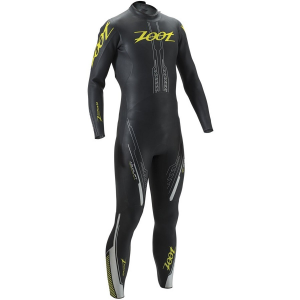 0 WetZoot so great--you get a high-quality neoprene wetsuit without forcing yourself and your family into poverty. The Zoot Z Force 1. 0 WetZoot is made with Yamamoto C38 neoprene, a highly flexible material that won't restrict movement. The C38 is also coated with hydrodynamic Super Composite Skin for a slick surface to reduce drag in the water. The suit is cut into specific, anatomic panels. The back is made with Aqualift, a 5mm neoprene that increases your buoyancy to keep you in an efficient swimming position. The leg panel design also works with your body by keeping your legs in a natural position for swimming.